- Transportation from the hostel to project site and back. - Ticket to the water puppetry show. - Logistic and practice for the performances. Water puppetry is a tradition that dates back as far as the 11th century when it originated in the villages of the Red River Delta area of northern Vietnam. The puppets are made out of wood and then lacquered. The shows are performed in a waist-deep pool. A large bamboo rod supports the puppet under the water and is used by the puppeteers, who are normally hidden behind a screen, to control them. Thus the puppets appear to be moving over the water. In the past, when the rice fields were flooded, the villagers would entertain each other using this form of puppet play. The theme of the plays has a strong reference to Vietnamese folklore. It is mainly about daily life in Vietnam’s rural areas and Vietnamese folk tales that are told by the elderly, of which stories of the harvest, of fishing and of festivals are highlighted. Water puppetry nearly died during the war years but has been revived in recent years and is enjoyed by Vietnamese and foreigners. It was recognized as national heritage and it now is nominated to be a UNESCO’s Intangible Cultural Heritage. Many folk arts from years of heritage and techniques had been passed down through many generations can be discovered in many Vietnamese northern provinces. However, in today’s modern society, as the result of globalization and imported culture, the art of practicing traditional performance among youth faces the brink of extinction. Finding passionate new generation who are committed to its practice and its teaching to the next generation is a challenge, and these once loved folk arts are losing in popularity compared to the modern taste. Educating the public of their value and role, in addition to teaching of why and how to appreciate these forms of art are of great importance in preserving the cultural heritage of the city and the country. 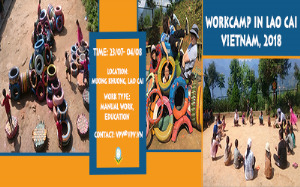 This is the very first time that Volunteers for Peace Vietnam has held a heritage workcamp on water puppetry. Within the framework of Partnerships Actions and Tools for Heritages (P.A.T.H) project, the workcamp aspires to promote the preservation of intangible cultural heritage, to strengthen international exchange as well as inspire the youth who are the key factors in heritage preservation and promotion. Visit the miniature water puppetry stage, watch the show and join the workshop about puppet-making techniques. The work will be instructed by puppeteer Phan Thanh Liem who was born into a family of water puppet craftsmen for seven generations. He is the first person to create a spectacle of the water puppets in miniature. The work will take place in the puppeteer’s four-storey house in Hanoi. There is an exhibition of puppets made by the artist on the first and the second floor. Making the puppet is on the third floor and learning how to control the puppet and perform is on the fourth floor where a mini and portable water stage is set up. Learn the process of making a puppet. Paint the puppets used for the performance. Learn how to perform with puppets in the water. Perform water puppetry in 03 local schools. Share what you’ve learnt and thought about Vietnamese water puppetry with local students. Only in Vietnam can you enjoy such a unique traditional art performance. 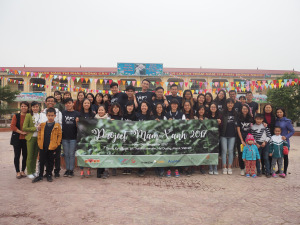 Joining this special workcamp, volunteers will gain rewarding experiences in the sense that you are not only the audience but also the puppet-maker and the performer. Working at the puppeteer’s house will also offer you an insight into Vietnamese daily life and the way that Vietnamese heritage is preserved by dedicated artists. Volunteers can take bus no. 07 (yellow and red bus) which costs 7.000 VND/ride at the far right corner of the parking area to the last bus stop. Then volunteers can take a taxi from there to VPV House (3-4 USD). VPV House Address: No.72 Pham Than Duat Str., Mai Dich, Cau Giay, Ha Noi. You can show the taxi driver the address in Vietnamese “Số 72, Phạm Thận Duật, Mai Dịch, Cầu Giấy, Hà Nội”. VPV can also arrange a pick-up for you. In that case, please send us details of your flight via email some days in advance and pay for the taxi yourself. 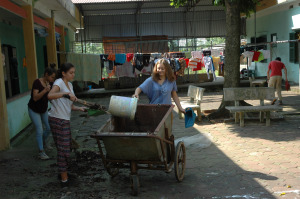 Volunteers are encouraged to come to the workcamp with ideas for group activities of the camp. Volunteers will have 2 days off on Saturday and Sunday at the end of the 1st week of camp. Volunteers can visit Hanoi tourist attractions. Or volunteers can leave the city on Saturday morning and take the bus back to other provinces near Hanoi. In case volunteers stay at the accommodation, food will be still provided. Office: 18 Ngo Huyen, Hoan Kiem District, Ha Noi, Viet Nam. Volunteers will stay collectively in the volunteer house, with mattress, pilow and fan provided. Food is also provided at accommodation. If volunteers have any food requirements such as allergies or vegetarian diets, please make it clear in the application form and inform the camp leaders on the 1st day of the program. NOTE: Your personal items are not insured by us! So PLEASE avoid bringing expensive electronic items! 2.6. Electricity in Vietnam is 220 V and 50Hz. Check your appliance before your trip to see whether you need a voltage converter. There are three main types of outlets in Vietnam: flat blade plug, two round pins, and two parallel flat pins with ground pin. If your appliances plug is different (such as those from Australia, Austria, Germany, Italy, Hongkong, New Zealand, Singapore) you will need a plug adapter. The adapter can be purchased from many outlets in your home country as well as at the airport. Normally the volunteer only needs a tourist visa to join VPV’s workcamps.